As its name suggests, The Hive, in Worcester, is a busy hub of work and social activities, for people of all ages and interests. 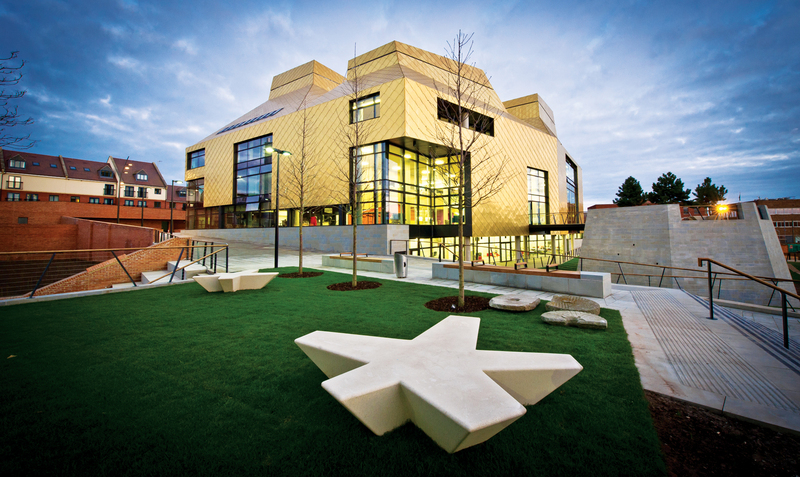 It opened in July 2012, and is the UK’s first integrated public and university library, as well as hosting: a local history centre, records office and archive; an archaeological centre; exhibition areas; a business centre; reading and learning spaces; council customer services; and a café. Such multiple uses – and the fact that the number of visitors is double the design occupancy, at around 900,000 per year – has made it a challenge to meet the building’s design aims, utility performance targets, and its social and environmental goals. 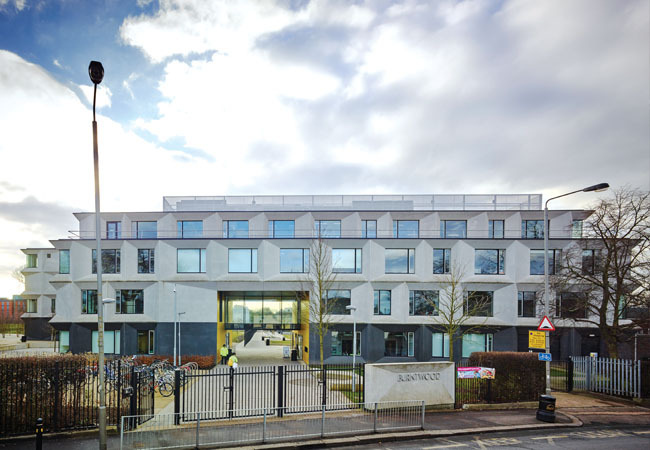 In its first three years of operation, however, The Hive – which won the CIBSE Building Performance Award for new-build project (more than £5m) in 2013 – significantly bettered its design utility performance targets, thanks to its low-energy design and proactive building management. This article highlights the importance of occupant-related loads in achieving this, and of separating the energy consumed by building services from the occupancy energy consumption when evaluating the performance of constructions in the nearly zero energy building (nZEB) era. The Hive took part in the IEE-funded project iSERV, and its performance was assessed between December 2012 and December 2015, as part of Afroditi-Maria Konidari’s doctoral thesis. Operational energy and sensor data was recorded at 10-minute intervals and, together with building assets data, was processed through the K2n iSERVcmb analysis framework and platform. This analysis was supplemented by data collected via post-occupancy evaluation (POE) surveys and indoor environment quality (IEQ) field measurements. The following is a summary of how The Hive’s operational performance compared with its design targets, applicable standards and professional guidelines. The five-storey building – clad in copper aluminium alloy – is made of reinforced concrete and has a cross-laminated timber roof. 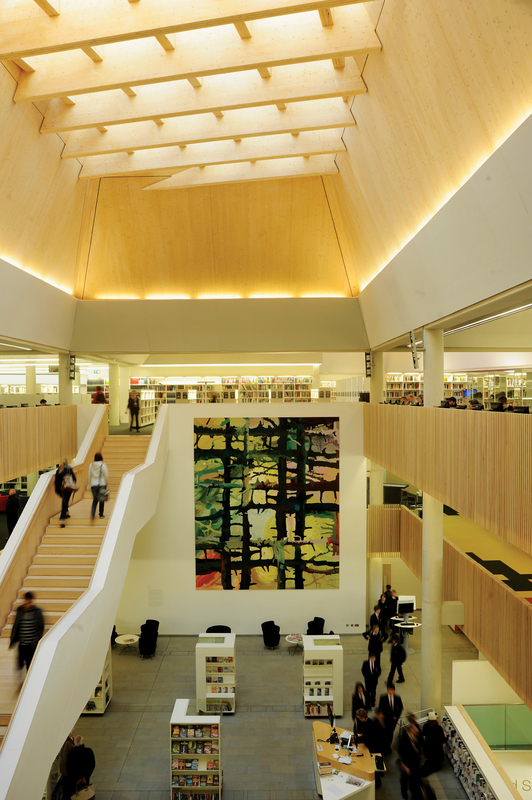 While it is a multi-use facility, the library and circulation areas occupy 62.5% of the 13,253m2 floor area. The key client requirements were connection, integration, inclusivity, wellbeing and sustainability. As a result, it was designed as an innovative and sustainable ‘social landscape’ that would promote curiosity and exploration, and allow free user movement around the building. It had to meet these aims while also achieving utility performance targets and a mix of social and environmental goals (see Table 1). From its peak in 2013 to the end of 2015, The Hive’s annual electrical use was monitored by end use – from AHUs, cold generators, pumps, dehumidification and terminal units to lifts, lighting and small power. The major reduction occurred in the building’s small-power use, which accounted for approximately 87% of the 448,385.3kWh savings. These improvements were achieved by control and equipment changes, plus insights from the monitoring systems. The electricity-use reduction amounts to a remarkable 42% from its peak in May 2013 – a saving made possible by the building design, monitoring and the controls installed. 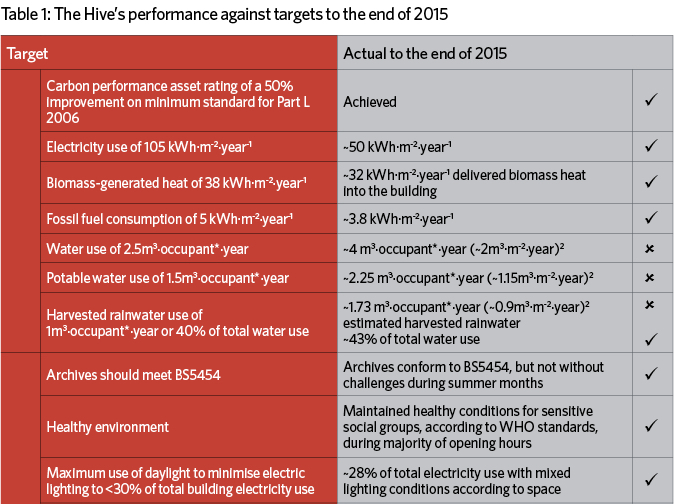 At the end of the monitoring period, The Hive consumed 50kWh·m-2·year-1 of electricity about half of its design target. Most (73%) of The Hive’s 221 internal floor areas are naturally ventilated, with the rest mechanically ventilated. The building’s normalised annual electricity use for 2015 bettered nearly all the potentially applicable industry – as well as other – published benchmarks relating to design and servicing. 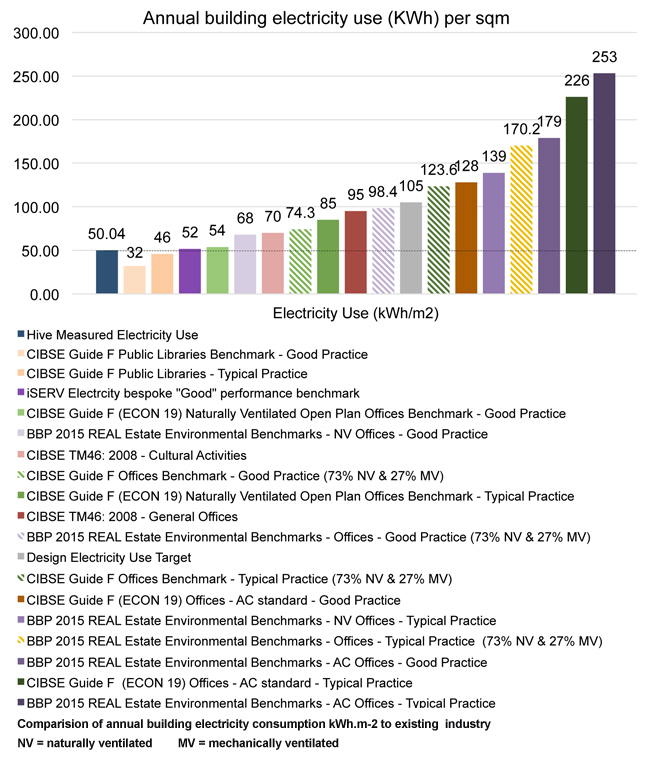 This included a pro-rata CIBSE Guide F (ECON19) Office benchmark derived from those for naturally ventilated and mechanically ventilated offices respectively (see annual building electricity use graph below). It also matched a ‘good’ standard benchmark produced from the K2n iSERV platform, which is generated for the specific mixture of spaces, activities and services in the building. 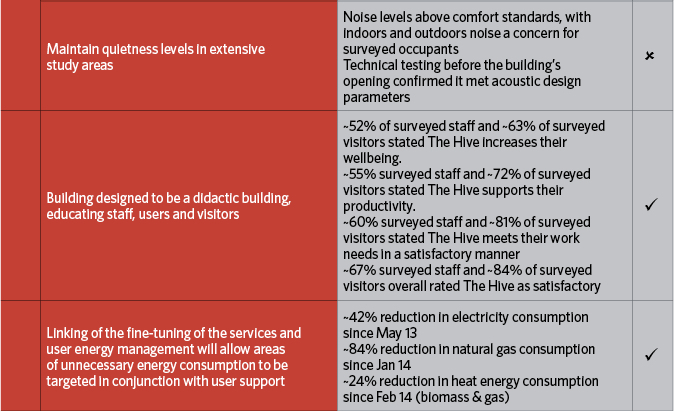 The Hive’s measured annual gas and biomass use also comfortably met design aims, at 76% and 84% of their targets respectively in the same year. 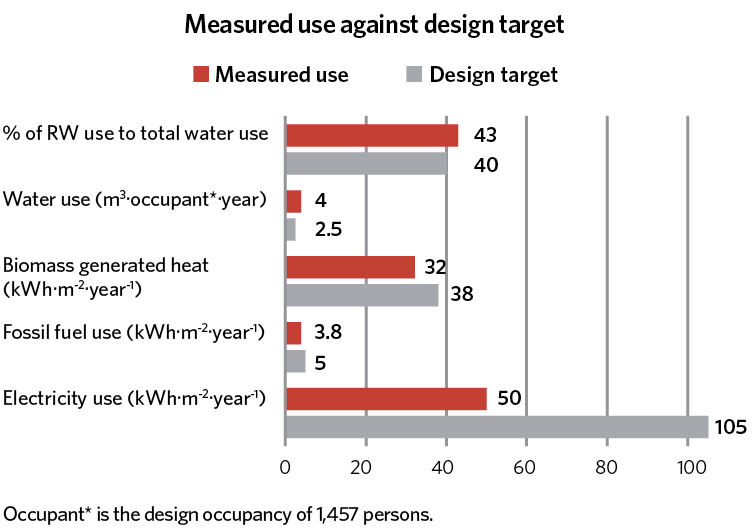 Its target for percentage of harvested rainwater use to total water use was also met, though its actual water consumption per design occupant exceeded the design targets. However, when the number of visitors – which amounted to double the design occupancy – was considered, The Hive met its water targets per occupant. So the measured data shows the building meets all of its designed utility performance targets (see Figure 2). Harvesting rainwater: This accounted for 43% of the total water use by the end of 2015. Additional savings were achieved through the river-water cooling system, which uses a nearby watercourse as a heat sink. Once operational problems related to river-water abstraction were overcome, the system saved the equivalent of 1.1% of The Hive’s electricity use in 2015 compared with the energy consumed by the building’s cooling system during the first two years. This was accompanied by a reduction in the chillers’ energy use of approximately 21% from 2014 to 2015. Having a robust contextual framework into which the operational data can be fed enables targeted actions to be taken. The K2n iSERV platform provided this framework for this study. References: 1. Not including biomass fuel and assuming gas usage for peak loads and backup only. 2. Calculated considering that the design occupancy amounts to 1,457 people, which is around 450,000 visits per year. Actual visits are double this, at around 900,000. Low utility consumption alone does not make a good building, so IEQ assessments were also undertaken. These showed that the energy efficiency obtained at The Hive was not at the expense of healthy indoor conditions. The majority of the monitored areas maintained healthy conditions during opening hours and met comfort standards. Maintaining comfort conditions – as specified by CIBSE guidance – for the activities housed by the building did present a challenge for some spaces because of the nature of their design. For example, most monitored spaces experienced cooler conditions than the operational temperatures recommended by CIBSE. However, this did not seem to affect visitors’ perceptions or enjoyment of the facilities negatively. Staff were slightly more critical, possibly because of a perceived reduction in the control they had, as well as the conditions. Noise levels exceeding CIBSE comfort standards. In agreement with these measurements, the POE surveys noted local issues with ventilation, RH, air temperature, and a lack of personal controls in specific work areas. Indoor noise levels were also identified as a problem by all occupants. But the surveys also offered evidence of end users’ satisfaction with all general building aspects and indoor conditions, as well as with most of their specific work-area conditions. 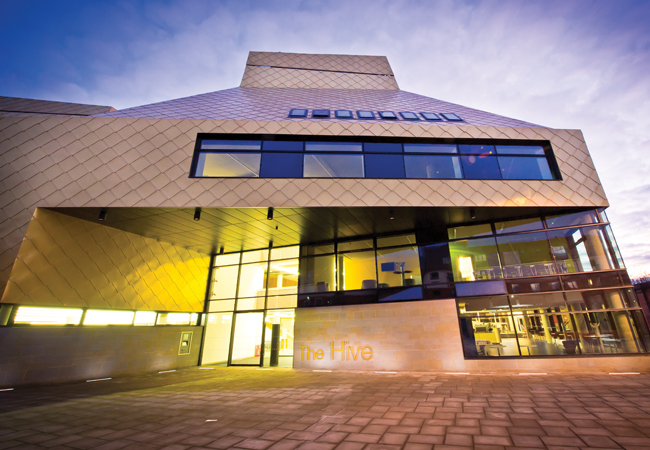 The Hive’s design – plus the large and diverse visitor groups – have led to issues of noise and transfer within some open-plan spaces. These are not considered design-performance failures, but rather exemplify the inevitable design trade-offs in open-plan, mixed-mode buildings when they are occupied by real people. It is likely that energy use in parts of the building might rise slightly in the near future, to achieve a balance between the design conditions for activities hosted and the need to meet low-carbon ambitions. The data shows there is reasonable headroom in this consumption to exceed design targets comfortably. In operation, The Hive readily met and improved on its utility performance design targets, while also achieving almost all of its social and environmental aims. It has demonstrated what is possible in an operational building housing a variety of activities when good design, monitoring and control co-exist. For more information, visit The Hive and iServ.